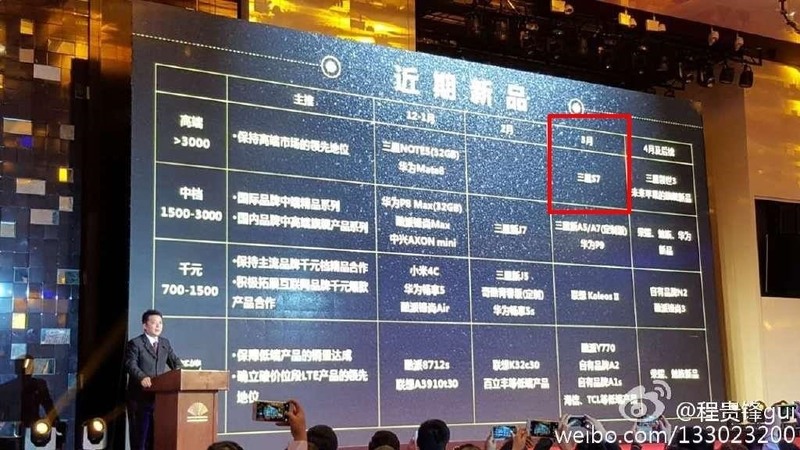 A slide shown during a China Mobile conference indicates that Samsung's Galaxy S7 handsets should be hitting the market next March. If this chart is to be believed, it strongly suggests that Samsung will unveil its flagships at Mobile World Congress in Barcelona (Feb. 22-25, 2016). For reference, the public got its first look at the Galaxy S6 and S6 Edge on March 1st at last year's MWC; the handsets were released a little over a month later on April 10th. According to Evan Blass, also known as famed device-leaker (@evleaks, Samsung is rumored to launch five or more models in 2016: the Galaxy S7 and S7+, Galaxy S7 Edge and S7 Edge+, and Galaxy Note 6. Blass also hinted at the possibility of a companion device to pair with the Note 6. We'll probably have to wait a while longer to get more details about the S7+ and S7 Edge+, as well as the Note 6, as Samsung traditionally debuts its phablets around August or September. However, some chatter predicts the Note 6 to boast unprecedented processing power and improved battery life. It's also rumored that the device will include a thermometer, barometer, compass, and sensors to measure heart rate and blood pressure, but these are nothing new on flagship Samsung units. For now, though, this isn't more than an educated guess, so we'll see if anything more concrete pops up in the coming months.